We write cover letters, we practice elevator speeches, we interview and hope to be at our best each time. Organizations have mission statements – or they should; in order to spell out their purpose, their reasons for existing. This written and likely publicized statement is to announce their core purpose and focus – and typically this should not change over time. No matter where we work or what company we work for – our own work ethics should define us in any environment. So why not create your own personal/professional mission statement? You can use it as a LinkedIn profile, in all of your cover letters, and in small part within the profile of your Resume when space allows. If you find this a bit challenging, try it out on your partner or spouse first, then on another person whose job you are familiar with. Consider your own work ethic and beliefs. Your personal/professional mission statement should be applicable throughout your career – no matter where you work or what you do for a living. Categories: Career Transition | Tags: personal mission statements, work ethics, work hard on yourself | Permalink. What exactly does this mean, work ethics? Now this image/quote is powerful by itself, but by definition, work ethics is: the principle that hard work is intrinsically virtuous or worthy of reward. 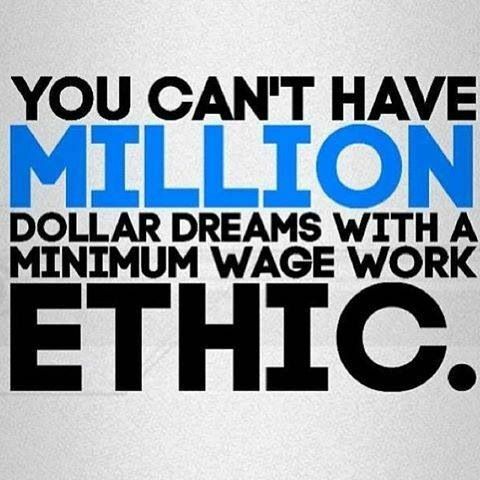 In other words, a work ethic is a set of moral principles that one abides by in their work. There are several factors worth mentioning here, and we will. Does an employer need to empower the employee first, or is the work ethic innate – something shown in the character of the employee and not something that can be trained. Is it something that could have been, or should have been – learned during the interview process? First, let’s look at a few workplace scenarios and you be the judge. You are the customer in line, at a retail store. The cashier you are waiting on is distracted by personal conversation with another cashier – thereby ignoring the job he/she was hired to do, and most importantly – you as the customer. You are back at this same store, same cashier. This time, a timely and friendly transaction. However, you happen to comment on the price increase you noticed on certain products. The cashier casually whispers to you that everything there is overpriced. Back again – same store, different cashier. The cashier is rather grumpy and doesn’t bother with the automated ‘hello, how are you’ greeting. Instead, rattles off a few reasons they are so unhappy working there. Their boss, their wages, the hours, the required overtime. You didn’t ask – but were told anyway. The following week, you overhear a manager scolding and using foul language to an employee – loud enough for the employee to be humiliated and embarrassed; making it difficult for them to face their customers the remainder of the day, with the upbeat attitude expected of them. And yet a different day, here you are back again. You realize, you shop a lot regardless of your discomfort with the level of service. This time it is obvious that you are in need of some direction or help, but no one is making eye contact with you. You are not being acknowledged because someone likely doesn’t want to do the work. Most of these scenarios are training opportunities. Training of the hiring managers – to hire with character in mind, not just a warm body. And training of the employees – through on boarding, orientation and recurrent training on service expectations. Customer service really should be a complete circle of attention to service, from the inside out. management being inappropriate about disciplining the employee, in a public setting, etc. and maybe the employee who complains about their employer, their co-workers, etc. – to you the customer. punching the time clock for someone other than yourself? Well, that is a lack of a lot of things – and likely grounds for termination. Most of these scenarios are training issues. The uncomfortable ones can be avoided by hiring right, the first time around. Employers: Are you asking the right questions, for the right reasons? Candidates: Are you prepared to respond when asked questions that are focused on work ethics? Categories: Career Transition | Tags: accountable, character, ethics, training opportunity], trusted employee, trustworthy, work ethics | Permalink.